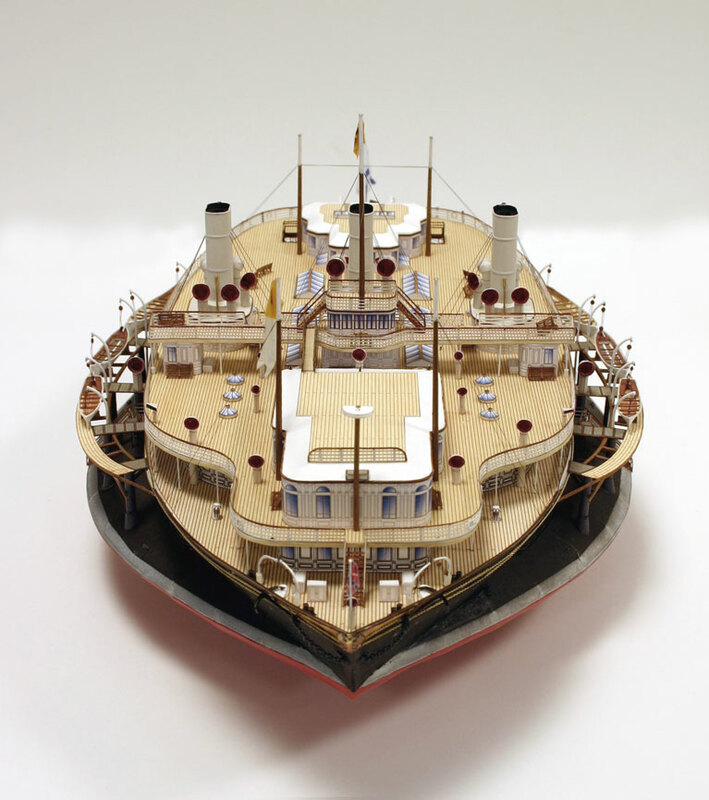 The Holy Grail of 19th century naval architecture was a ship that would not pitch and roll at sea to allow a steady aim for its guns, and that required the least amount of armor around its hull. The shape with the shortest circumference for a given area is the circle, and many naval designers had tinkered with short, broad hull shapes. Russian Vice-Admiral Andrey A. Popoff took the principle to its logical conclusion when he proposed a completely circular ironclad. Two vessels for the Black Sea fleet were built on this design, Novgorod in 1873, and Kiev (later renamed Vitse-Admiral Popoff) in 1875. Their performance was less than satisfactory. They were unstable and extremely hard to steer. Their guns were mounted in fixed positions and were aimed by turning the entire ship, a near impossible task on a vessel that wobbles like a saucer in a tub. Popoff went back to the drawing board. His next design was a compromise – a vessel shaped along traditional lines to faciliate effective steering, but with an extraordinarily wide beam, and riding on an oval, lower hull, called a “turbot,” after the flat fish. Czar Alexander II was taken with the idea and afforded Popoff an opportunity to try it out: The Czar’s Black Sea yacht Livadia had been lost in a storm the previous October and a replacement was required. Why not build the new yacht on Popoff’s plans? In addition to discovering the new design’s potential merits for future men-of-war, such a yacht, if successful, would benefit the Czar’s wife who suffered terribly from sea-sickness. Popoff commissioned the renowned Scottish firm of John Elder & Sons at Govan, near Glasgow. The choice was no accident. 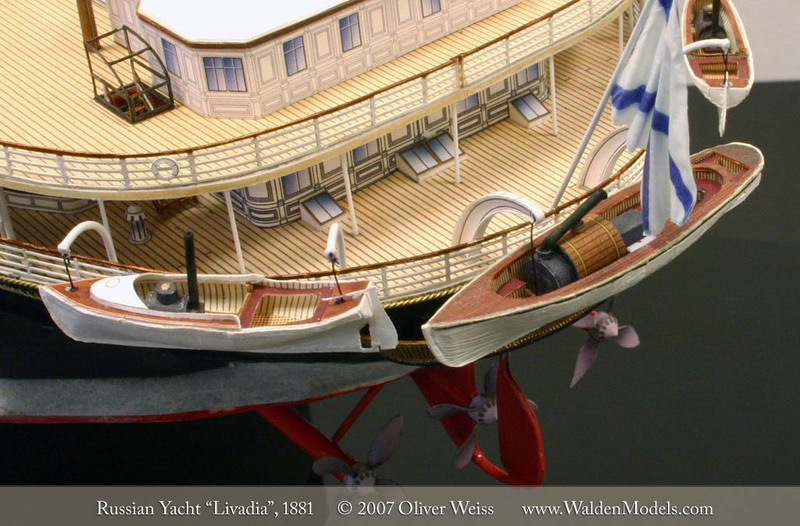 As early as 1859 John Elder had studied the problem of broad-hulled ships and had formed a series of ideas regarding their design and probable performance benefits. The firm’s owner, Sir William Pearce was a shrewd businessman who realized the huge publicity value this commission carried. Pearce was given Popoff’s plans and the stipulation that the vessel must be appointed in the best and richest manner possible. Money was no object; in fact Pearce did not contract for a fixed price, but for a percentage of the cost of the vessel. The Livadia also had to achieve a speed of 15 knots. There were contract penalties if she fell short and premiums if she exceeded this speed. If she did not reach 14 knots, the Russian Admiralty could refuse her altogether and only take the engines. Pearce knew that the novel hull shape was an unknown quantity. To establish power requirements and the best possible arrangement of screws and rudder, he towed a 1/10th scale model around Loch Lomond. On September 5, 1879 the contract was signed and building commenced immediately under the eyes of Popoff himself, and of Captain Goulaeff, chief constructor of the Russian navy. 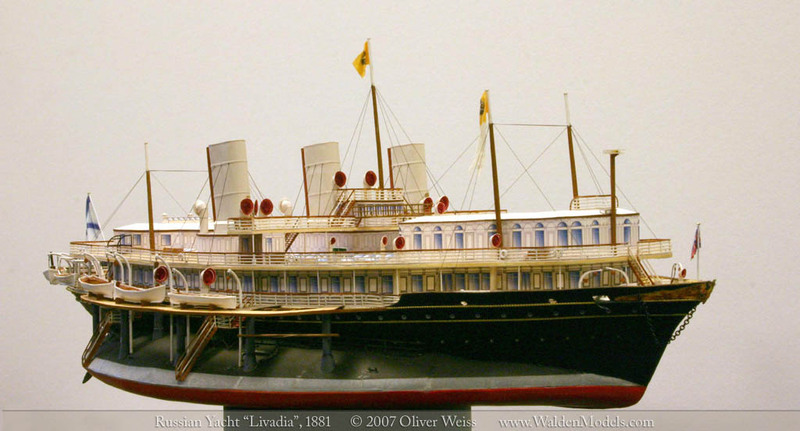 On the morning of July 7, 1880, large crowds gathered to witness the launch of the Livadia. A Russian Orthodox priest performed a religious ceremony, the Duchess of Hamilton christened the ship. Grand Duke Alexei Alexandrovich gave a speech extolling the achievements of Scottish ship-building. But no one knew exactly just how the Livadia would behave once she had run off the stocks. There was considerable concern for the 10,000 or so spectators who had gathered on the opposite side of the Clyde. In the event, the Livadia slid gracefully into the water and was brought round to the shipyard’s dock where she spent the next three months, outfitting. 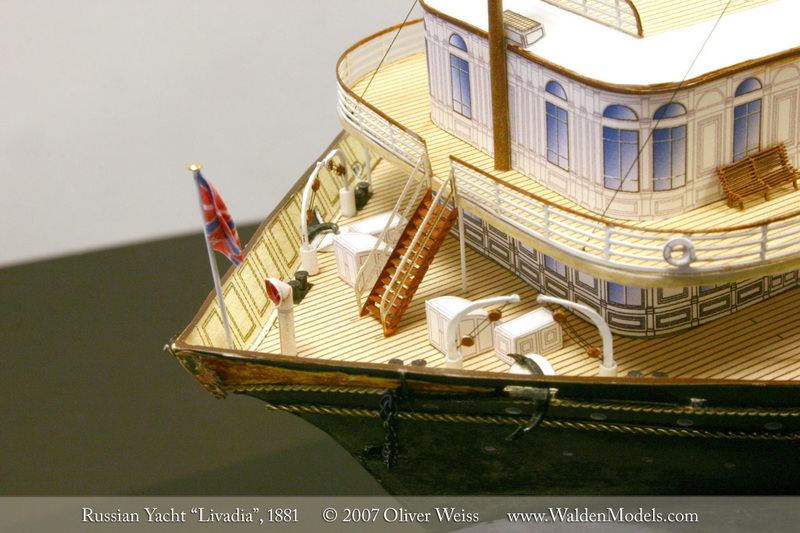 The Livadia being a yacht, her primary function was to provide the ultimate in luxury, safety and comfort. 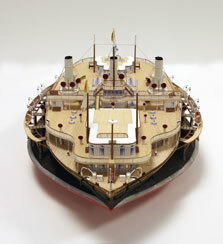 The lower hull, the “turbot”, was divided into 40 watertight compartments, and the vessel received an extensive double-bottom. 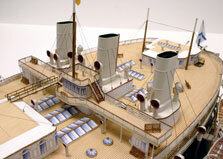 Huge skylights and countless ventilators penetrated the decks to provide light and air. Sir William employed a host of artisans and craftsmen under the direction of the celebrated interior architect William Leiper, who was lured from Paris for this project. The imperial saloon was finished in Louis Seize style and featured flower beds and a fairy fountain illuminated with lights in changing colors. Everywhere was rich wood paneling, tiled walls and ceilings and exquisite furniture. Electrical lighting was installed throughout the ship, including a powerful searchlight, one of the first such installations on board ship. Three mahogany steam launches were ordered, but in an odd show of economy the row boats installed were those of the old Livadia. With all this novelty and opulence, the Livadia became the subject of intense public debate. Many condemned her as not seaworthy; others heralded her as the shape of all future ships. Newspapers ran frequent editorials on new trends in ship-building and conflicting “expert opinions” were aired in professional publications. On September 27, however, the ship drew a different kind of attention. Scotland Yard received word from the Russian government that Nihilists were plotting to blow up the ship by means of an infernal machine, disguised as a lump of coal. The Nihilists were a group consisting mainly of disillusioned intellectuals who sought to overthrow the Russian regime by assassinating Czar Alexander II. So far, the Czar had narrowly escaped three attempts on his life. Not surprisingly, Russian authorities were in a constant state of alarm and saw Nihilists at every street corner. Agents were dispatched at once. The coal already in the ship was removed and examined. The entire vessel was searched. Nothing was found, but fear continued to linger. Constables were posted on the Livadia day an night. 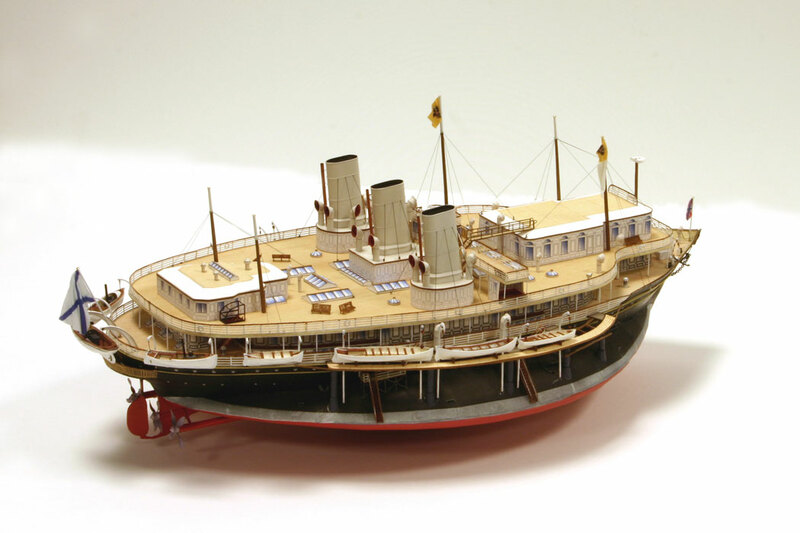 On October 6, 1880 the Czar’s new yacht left the Elder’s yard for her first trial run down the Clyde. Three steam tugs were brought along just in case. She handled beautifully and reached 12 knots under the watchful eyes of Pearce himself. On October 9 she ran the measured mile and happily achieved a top speed of 15¾ knots. This was on a foul bottom, as an appreciative press noted, and it was estimated that with properly balanced machinery and a freshly cleaned hull she might be able to reach 16 or even 17 knots. Her enormous engines developed 12,000 i.hp, about 40% more than cruiser of similar displacement but ordinary hull shape would need to reach the same speed. Coal consumption was to match, but of course this was of little concern. On October 12, 1880 the Livadia was officially accepted. John Elder & Sons received 2.7 million rubles, including 414,000 rubles in premiums for exceeding the target speed. Her complement boarded. Ensign, jack and standard were hoisted and on October 15 she began her long journey to Sebastopol on the Black Sea. First stop was London. While the ship lay at anchor on the Thames, Queen Victoria had a portfolio of 12 photographs made to document the vessel’s architectural splendor. Tragedy struck when a stoker adjusted one of the 112 Jablochkoff candles on board.  He accidentally touched the terminals of the primitive arc lamp and fell dead instantly. The Livadia next called at Plymouth before making her way across the channel to Brest, where the General-Admiral of the Russian Navy, the Grand Duke Constantine joined the ship. On October 19 she left Brest despite warnings of foul weather further south. The builders and experts on board warned the Grand Duke that the Livadia was not designed to weather hurricanes, but he commented that there was no better opportunity to put the yacht through her paces than to have her ride out a storm. Sure enough, the Livadia was soon caught in the kind of storm the Bay of Biscay is famous for, riding 27 foot waves for three days and nights. 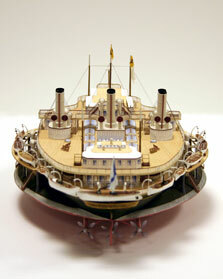 Admiral Popoff’s ship was put to tests the designer had never intended it to go through. While indeed she rolled very little and seemed to take small waves in good grace, it soon became apparent that the bigger rollers caused her to “slam,” that is, to strike the oncoming wave from the top, rather than part it with her bow. This trait is common to all flat-bottomed vessels, but the severity in this instance was unexpected. Nothing could be done to stop this behavior, it was as strong at two knots as it had been at eight. At times the passengers and crew felt as though the ship had bodily struck a rock and was in imminent danger of foundering. 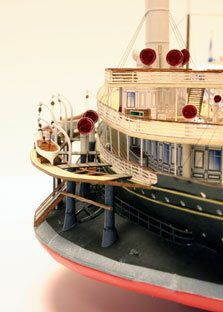 The ship pitched more than 9 degrees, causing green seas to come over the bow despite the vessel’s great height. Pumps were running day and night. On the morning of October 21, it was discovered that the first compartment of the double-bottom had filled with water. The Livadia sought the protection of the sheltered harbor of Ferrol on the Spanish coast. Here the hull was examined thoroughly. This had to be done by divers, as no dock then in existence would hold her. 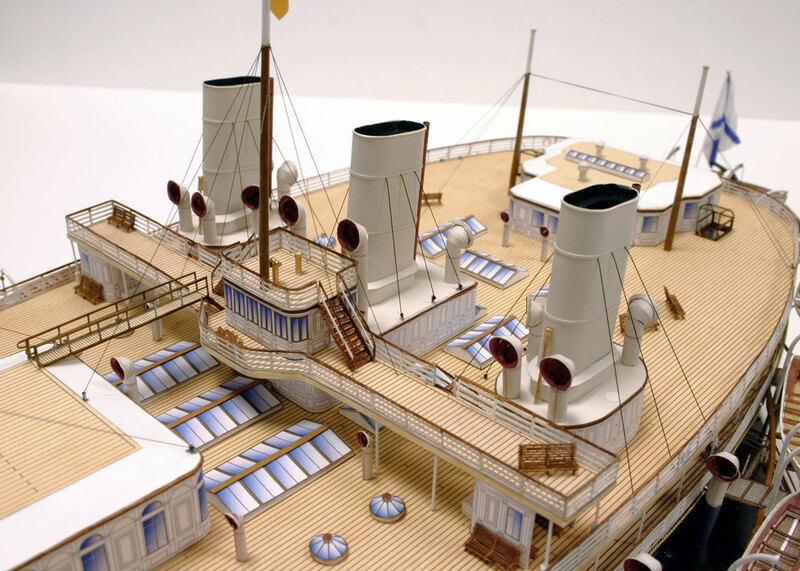 Five of her starboard watertight compartments had filled. Several of the outer hull plates had cracked along the rivet lines, one of the plates even had a corner torn out. The frames backing these sections had buckled over a length of 15 feet. Intense debate arose whether this damage had been caused solely by the action of the waves, or perhaps by floating wreckage, some of which had been observed during the storm. Little was known at the time about microscopic cracks that form when rivet-holes were cold-punched into steel plates, a circumstance that makes them susceptible to stress damage along the seams. The same effect amplified the damage to another ship more than thirty years later, the Titanic. Whatever the cause, repairs would have to be undertaken. As the dock then building at Sebastopol was not yet finished, it was decided that the Livadia should spend the winter at Ferrol. Now she came into her own as a true floating palace. Balls and entertainments, the brilliant nighttime illumination and luxurious accommodations drew the interest and admiration of high society. On March 13, 1881 the Nihilists succeeded in assassinating Czar Alexander at St. Petersburg. Czar Alexander III succeeded him. It had long been known that Alexander II’s son did not approve of his fathers enthusiastic indulgence of Popoff’s efforts to, as he put it, “round the domestic ship-architecture”. Popoff’s days as head of the Russian navy were numbered. One can imagine the change in spirits on board the Livadia. She left Ferrol on May 8, now under the command of Admiral Shestakov, and made her way across the Mediterranean without further mishap. Among other ports, she called at Naples where she was photographed at her moorings in the military harbor. On June 7 it was reported in London that the Livadia had entered the Bosporus, heading for Sebastopol. She arrived there on June 8, 1881, having travelled 3890 miles on 2900 tons of coal. Her only voyage in her intended cruising ground, the Black Sea, occurred on June 10-13, with Grand Duke Mikhail Nikolayevich and his family on board. The weather was stormy, and again the Livadia did not behave well. Her superstructure trembled, frightening her passengers. In the middle of June she entered dry dock at Sebastopol. 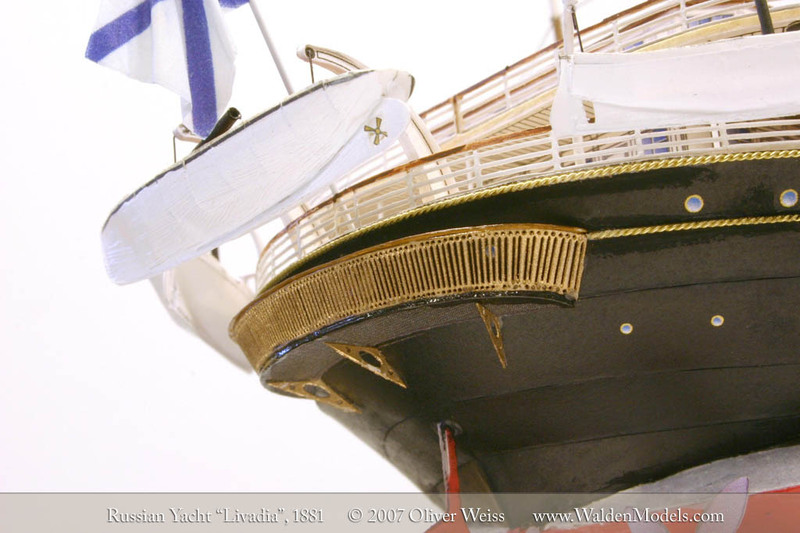 An admiralty commission was dispatched to report on the condition and performance of the vessel and the quality of the workmanship and materials. The commission’s report was disastrous. It declared the Livadia patently unfit for sea voyages, unless her forward hull were sheathed in wood and copper and the frame backing were doubled. However, Alexander III’s agenda was to be done with the Livadia as quickly as possible. None of the work recommended was performed, though three layers of sheet iron were fitted over the cracked plates. The hull was cleaned of marine growth and freshly painted. The admirality commission had arrived with a program of rigorous tests and from August 12 to August 24 the Livadia ran the measured mile 136 times, careful performance measurements being taken on each run. To Popoff’s horror, she could not reach more than 14½ knots on any one of them. It didn’t help that several competent members of the commission pointed out the inferior quality of coal used and the inexperience of the Russian engineers manning the engines. Popoff was sacked and replaced with the Czar’s brother. He was also held personally responsible for the “fraudulent” premium that had been paid out to John Elder & Sons. 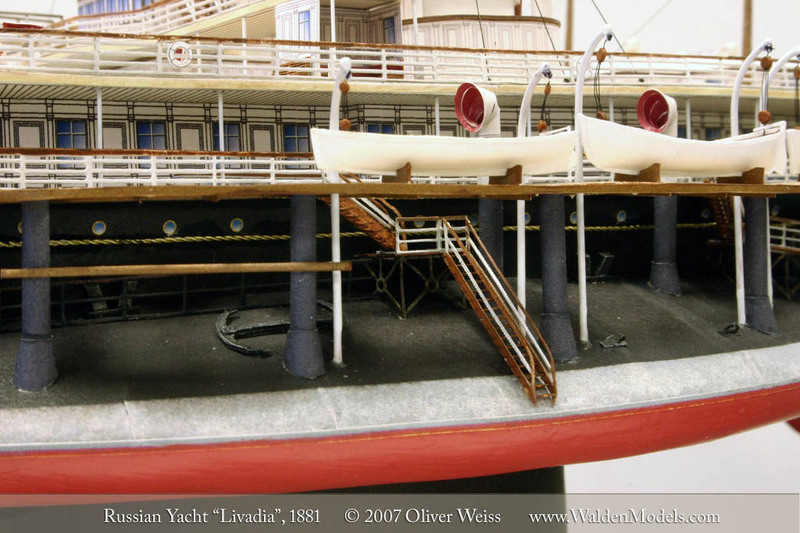 On August 27, 1881, the Livadia was permanently moored at Nikolayev. 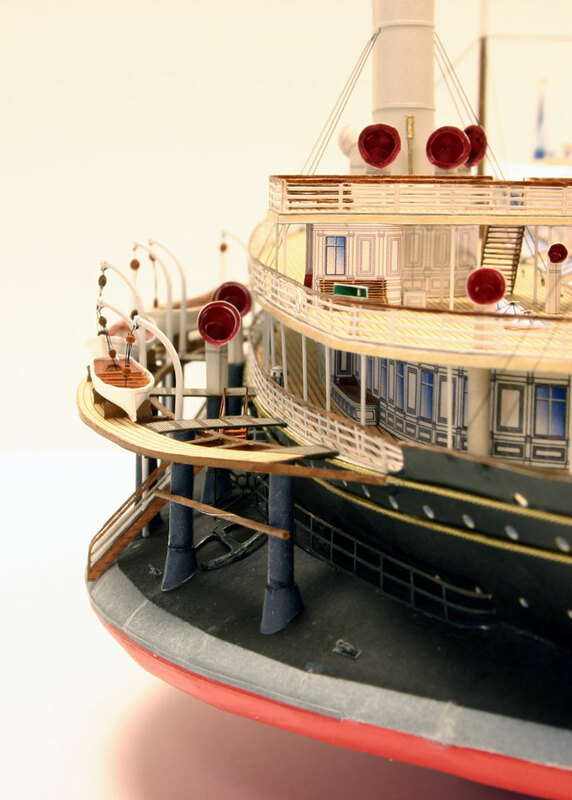 The press began referring to her delicately as “the former yacht.” In April of 1883 the ship was stripped of her prestigious name and given the sarcastic nomer Opuit, or Experience instead. For several years, the ship lay idle, while the navy tried to find a use for her. Eventually she was stripped of all her fine furnishings and powerful machinery. Her ten boilers went to the Twelve Apostles, her engines to the cruisers Minin, General-Admiral and Herzog Edinburg. The Imperial Saloon and the Grand Duke’s quarters were summarily removed and her elegant awning deck built over with a rough wooden shack. She was converted to a repair ship for the Baltic Fleet, a combination barracks, warehouse, and machine shop. For more than forty years she languished at her moorings at Sebastopol. By 1913 she was referred to only as “Block Ship No. 7.” In 1926 she was sold for scrap. Her remains fetched the lowly sum of 4,000 pounds. Even then she proved to be a tall order for the ship breakers. Her hulking outline could be seen until the end of the 1930s. “When she was getting on I had a model of her made – in fact, two; one of them,” he said, turning to me, “you saw the other day in my office. These models are troublesome and costly things to make. The one which I intended as a present to the Czar cost five hundred pounds. It was my present to his Majesty on the twenty-fifth anniversary of his succession. It arrived the day before, 17th February – 29th Feburary old style. The Czar was delighted with it. That evening there was a banquet at the Winter Palace, where he was then in residence. He had been threatened for some time by means of a black-edged letter finding its way every morning into the Palace, warning him in explicit terms that if his oppression did not cease he would not live past the anniversary of his accession, which would be the following day. When he was leading the way to the dining-hall from the drawing-room he turned to the lady with him – Princess Dolgoruki, his morganatic wife – and said: ‘By the way, I want to show you my new toy!’ The model had been placed in the salon at the head of the grand staircase and they stopped to examine it. Check here to add a backup CD and printed manual for only $5.00!